Work travel frequently takes me to states across the country and sometimes overseas. As a family historian, this provides me a tremendous opportunity to explore my genealogy on the ground. There's nothing like walking in your ancestors' footsteps. In the past two years, I've had incredible experiences in the American plains, Italy, and recently the Land of Lincoln. 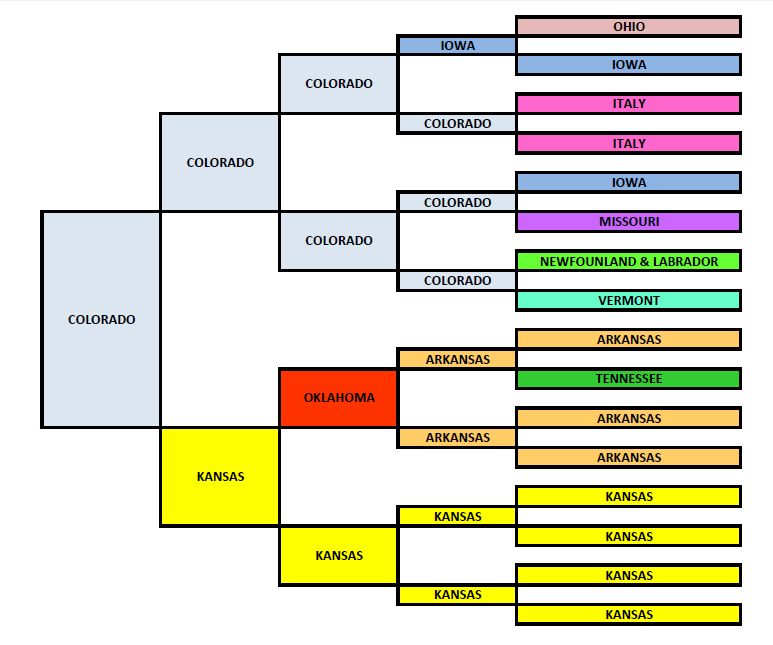 Each trip brought the genealogy to life in a way that simply isn't possible with a pedigree chart. Recently, though, I made a mistake. I was unexpectedly called to Decatur, Illinois and was unaware of any possible family link. The city didn't register in my mind, so I assumed there were no family ties. It was only after I returned home and was looking at some old unlabeled family photos that I realized I had missed an important research opportunity. I had a couple family photos that were taken at the East End Gallery, a photography studio in Decatur. 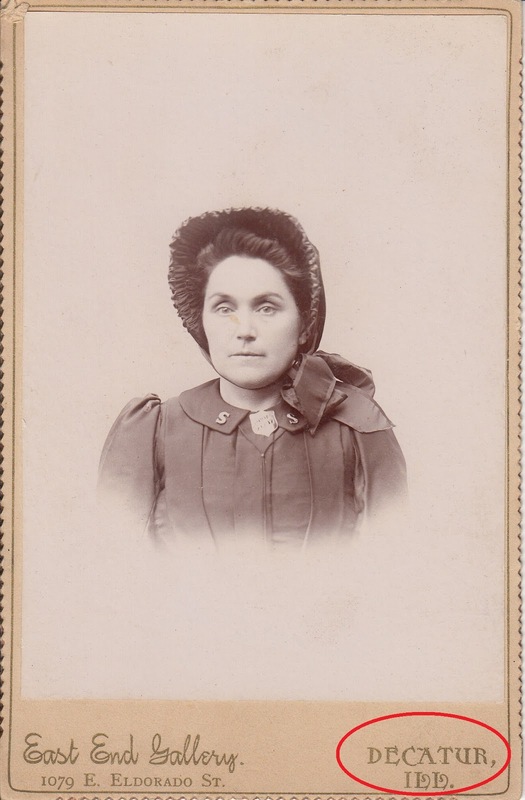 This unidentified woman has been of particular interest to me. Her facial features are familiar. Her uniform is fascinating. What's her story? Who is she? How did I forget the Decatur connection? While in town, I spent time in the city library mere feet away from the local history room. What new leads did I leave unexplored? The trip was an important reminder that our genealogy must always be prepared for the road. Mindful of this error and what I've learned from my past experiences, I thought about five things that are essential to successful family history road trips. The first lesson is to know where your ancestors lived their lives. Where were they born? Where did they marry? Where did they die and where were they buried? Last week, the longevity pedigree set the genealogy blogosphere on fire, and now the flames have spread to the birthplace pedigree created by J. Paul Hawthorne. It's a creative way to visually present our ancestors' birth locations. Family historians should take heed of this approach. Create a geographical pedigree for your ancestors' key life milestones: birth, marriage, death, and burial. But don't leave it in the chart! It's important to pinpoint the history on a map. After all, family history road trips are all about breathing life into genealogy. A simple tool to map your family's path is Google Maps. You can create individual maps tailored to specific life events, regions, surnames, or whatever! For example, I've created a Google Map marked with cemeteries where my direct ancestors are buried. This way, if I'm nearby, I know I need to plan a stop to pay my respects. On my road trip across the American plains, I learned the value of traveling with the proper vehicle. If you're renting a car, make sure your vehicle is capable of going off the beaten path. In October 2014, I rented a mid-size car that sat low to the ground. The low clearance prevented me from traveling down a dirt road that led to the ghost town of Haworth, which was founded by my 4th great-grandfather. The road was simply too muddy and rugged for my city-mouse car. That was a disappointment that could have been prevented if I was equipped with the proper vehicle. Yes, family history is an all-terrain, off road sport. Even older cemeteries can be difficult for smaller vehicles. For example, the entrance road to a family cemetery in Arkansas was a well-worn dirt path that initially seemed maneuverable. However, the wheel ruts had been eroded deep into the ground leaving a high wedge of soil in the middle of the road that dragged noisily along the underside of my rental car. I worried that I would tear something loose (and yet the persistent family historian in me drove onward, willing to sacrifice the muffler for the chance to visit my 2nd great-grandparents' graves, 'cause, you know, priorities). If you're going to be on the road visiting the sites of your family's history, it's wise to include the living. Are there cousins in the area - descended from a common ancestor - who may have important family lore or never-before-seen photographs? Not sure if you have cousins in the area? DNA can play an important role in identifying local family. Eyeball your Ancestry, FTDNA and 23andMe results zeroing in on the cousin match maps. Put your cousins on your map, build them into the itinerary, but be sure to give them a courtesy heads up that you'll be in the area. They may need time to dig out the family jewels you're keen to see. Oh, and keep Ben Franklin's sage advice in mind: "Guests, like fish, begin to smell after three days." If you're going to be on the road retracing your family's history, it's important to travel properly equipped. Just as Batman never leaves his cave without his utility belt, no genealogist should leave home without a few essentials that can make or break the research. A computer, tablet or other smart device is essential. After all, you need something to load up your tailored Google Maps (and the GPS to guide you). Additionally, my iPad and iPhone are both loaded with family history apps that empower me to quickly tap into my pedigree and ancestors' profiles. My genealogy is only the press of a finger away. Having this information at hand can deepen the impact of any family history road trip. These devices are also fantastic multi-faceted tools with the ability to take photos and record audio (in case you need to document an oral history). I also have a slim flatbed scanner that travels easily in a backpack. 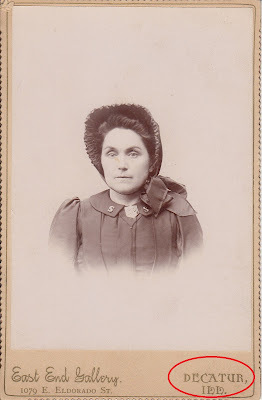 During my road trip across America's plains, it proved invaluable as I scanned dozens of 19th century family photos when visiting a great-aunt. The genealogist's toolkit should also include information on the opening hours for local resources, including libraries, historical and genealogical societies, courthouses, etc. You don't want to roll into town when your genealogy is closed for business. You may as well stay home. Lastly, given the tremendous popularity and research value of genetic genealogy, I think it's worth packing a DNA testing kit or two. If you're visiting family, you may as well have them spit while you scan. Also, if you're visiting older relatives, it's much easier to assist them with the sample collection process in person rather than over the phone or through mail. It helps mitigate the intimidation factor and mistakes. Retracing your family's life can be a moving experience. I found myself eyeing homesteads and cemeteries with sincere concern for preservation and respect. If you visit a homestead or cemetery, play the role of caretaker. Gently clean the headstone (Google for the safe ways to do this! ), pull the cemetery gate shut, and bring flowers to place at the grave. I like to purchase affordable fake flowers from local department stores (fake are durable and more likely to stick around for future visitors), and take updated photos for FindAGrave or BillionGraves. Whatever the location, you may be the first visitor in a long while. Survey the scene and determine what may be reasonable and appropriate for you to do or what is best to notify local officials about. Not all of us can travel extensively and visit every family history site of interest. But we can certainly take the steps to ensure that we are properly prepared should we unexpectedly be given the opportunity. Preparation is key and these tips have made my family history road trips more beneficial. 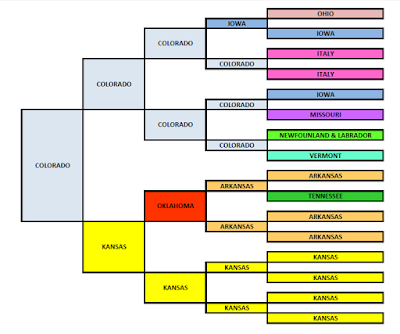 Is your genealogy ready for the road? Do you have an emergency grab bag at the ready to guide you on an unexpected trip? What family history road trip tips have worked for you? Love the post,and your presentation. Great tips with just a tad bit of humor. I'm glad you enjoyed the post and tips, Nell. I appreciate your comment! Great post with nice tips. I'm going to go make a couple of charts now so I'm prepared for any upcoming research trips. Thanks! Good luck and keep us posted on how those turn out. Appreciated the post and can relate to a lot of it. I've taken some chances with rental cars on gravel roads ... other times I've had to turn back. Great tips! I'm going to look into google mapping the grave sites. You never want to be hot on the trail of your family history and have to turn back because the road is too daunting! :) Good luck mapping and road tripping.